“Tsong-kha-pa (I: 53-54) identifies the final greatness of the stages of the path approach as its preventing the grave error of rejecting the Buddha’s teachings, rejecting the Dharma. Here, Tsong-kha-pa cites many texts, including the Perfection of Wisdom sutras, where the Buddha states that a practitioner must study, understand and actually practice all aspects of the path. If you really aspire to help many billions of living beings with diverse mental dispositions, then you have to understand and practice many diverse teachings and approaches. This is what prepares you. “Historically it has been the tradition among Tibetan masters to study and also to practice all the lineages—Sakya, Gagyu, Geluk, Nyingma—and Jonang as well. This is an excellent model. We should adopt a nonsectarian approach, not just studying all of these lineages but also putting their teachings into practice. “Question: Your Holiness, I feel agitated to see and hear the Shugden protestors outside the building here. How do I help myself? Please address this issue as many are uninformed about this. “Answer: We have had this problem for 370 years. It started during the time of the Fifth Dalai Lama. And from 1951 until the 1970’s, I myself worshipped this spirit. I used to be one of the practitioners! “One of my reasons for abandoning Shugden worship is that much of my efforts are directed toward promoting nonsectarianism—especially within Tibetan Buddhism. I always encourage people to receive teachings from the teachers of diverse traditions. This is like the Fifth Dalai Lama and many other great lamas, who received teachings within many traditions. Since the late 1960’s and early 1970’s, down to today, I have been practicing this way myself. “A Nyingma teacher, Khunu Lama Rinpoche, initially gave me teachings on Shantideva’s texts. This lama was very nonsectarian, having received innumerable teachings from many different traditions. After this, I wanted to receive from this great lama a certain teaching distinct to the Nyingma tradition. I asked my tutor, Ling Rinpoche, pointing out that I had already received some teachings from this lama, but I now wanted to receive teachings on an important Nyingma tantric text. “Ling Rinpoche was a little bit cautious about this because of Shugden. He never worshipped the spirit but he was cautious about it. (My other tutor, Trijang Rinpoche, was very close to this spirit practice.) The rumor that was circulating was that if a Geluk lama takes teachings in the Nyingma tradition, Shugden would destroy him. Ling Rinpoche was a bit frightened for me and he really warned me to be careful. The Shugden worshippers have a tradition that one must be extremely strict about one’s own distinctive Geluk tradition. “Actually, I think this standpoint deprives people of religious freedom, preventing them from taking other teachings. In practice, discouraging a standpoint that deprives people of the freedom to choose is actually an affirmation of religious freedom. A double negation is an affirmation. “Around 1970, I was reading the life stories of many great lamas, mainly of the Geluk tradition. I had the idea that if Shugden is truly reliable, then most of the great lamas who tutored the Dalai Lamas must have practiced Shugden worship. It turns out that this is not the case. So I developed some doubt and the more I investigated, the clearer it became. “For example, the Fifth Dalai Lama very explicitly explains his position vis-à-vis the worship of this spirit [Two sources are cited here, from autobiographical works of the Fifth Dalai Lama—see below]. He explains what it is and he explains the causes and conditions that gave rise to it. He describes the destructive functions of this particular spirit. He says that it arose from misguided motivation and that as a spirit it manifests as a violator of a pledge. According to the Fifth Dalai Lama, its function is to harm both the Buddhist doctrine and living beings. “Once I realized these things, it was my moral responsibility to make the facts clear. Whether you listen to me is entirely up to you as an individual. From the outset, I told both Tibetans and some of our other friends what I had come to understand. They are free to listen to my advice or not. It is an individual right to accept religion or not to accept it. Accepting this religion or that religion is entirely up to the individual. “My opinion is that Shugden worship is actually not a genuine practice of Dharma; it is simply worship of a worldly spirit. This is another aspect of the problem: from what I have taught, I think you can see that Tibetan Buddhism is a continuation of the pure lineage of the Nalanda tradition, which relies on reasoning, not blind belief. So it is very sad that certain Tibetan practices could cause this profound and rich tradition to become a sort of spirit worship. “Both the Fifth Dalai Lama and the Thirteenth Dalai Lama were gravely critical toward this spirit. Since I am considered the reincarnation of these Dalai Lamas, it is only logical that my life should follow theirs. One could say that it proves that I am a true reincarnation! Dalai Lama, (Translated and edited by Guy Newland); 2012; From Here to Enlightenment: An Introduction to Tsong-kha-pa’s Classic Text, The Great Treatise on the Stages of the Path to Enlightenment; Snowlion Publications; Boston, MA. Fifth Dalai Lama, Collected Works, vol. Ha, pp. 423-424, as well as the Fifth’s autobiography. Tsong-kha-pa, (Translated by The Lamrim Chenmo Translation Committee) 2000; The Great Treatise on the Stages of the Path to Enlightenment: Lamrim Chenmo; Snowlion Publications, Ithaca, NY. It is unfortunate that others allow themselves to be reduced to “running dogs” for their master as in the case of the hundreds of westerners who have given attention via their incessant barking to DS. If it were not for these dogs there would have been nothing to blog about. This should be between HHDL and DS and it’s proponent “Lamas”. True. It is an issue between Tibetans. But Tibetan lamas use the faith of their Western devotees for their chess game, which is Tibetan chess. And Western followers are too naive and deluded to see that they are just abused for a personal agenda, and they allowed to be used for this Tibetan chess with the enthusiasm of new converts which is always over the top. Consider carefully the content of this below. Since the time of the Fifth Dalai Lama, all the successive Dalai Lamas and many great masters have placed stringent restrictions on the propitiation of harmful spirit of Dolgyal for Tibet’s common spiritual and political interests. Like his predecessors, His Holiness the Fourteenth Dalai Lama, following a long and careful investigation, has also clearly advised against the propitiation of Dolgyal. A large number of Tibetans have followed his advice and gave up propitiating Dolgyal. However, a small number of Tibetans have remained ignorant about the propitiation. In order to lead the ignorant to righteous path, the Tibetan Parliament-in-Exile unanimously passed resolutions on 6 June 1996, 17 September 1997 and 15 March 2008. The majority of Tibetans – including the both monastic and lay community particularly the three monastic seats – who have acted upon the resolutions deserves appreciation. Yet, a small number of ignorant Dolgyal propitiators have no consideration for Tibet’s spiritual and political interests and the personal security of His Holiness the Dalai Lama. They are being deceived by the Chinese government through monetary and material incentive and are used as political tools. They have been also instigating foreigners to carry out disinformation campaigns at every opportunity. In a recent incident in San Francisco, they employed a handful of people, who are completely ignorant about the basic principles of Buddhism, to slander His Holiness the Dalai Lama with baseless accusations. To present these misdeeds for fair and correct understanding of the Tibetan people and the people of the world who support truth and justice, it is imperative that the following resolution be passed to reiterate and implement the earlier resolutions adopted by the House. Further recognises also the Dolgyal followers and others – whose have caused grave harm to the faith and polity of Tibet under the Chinese government’s ploy and in violation of the law of Karma – as criminals in history. If what is written above is true then all of the Tibetan talk about democracy is a farce. As much as I am against anything which pretends to be a protector of the Three Jewels , I am also in support of separation of church and state. Padma Kadag, I think the trouble is that church and state in this case are pretty closely aligned. China is using religious issues to cause serious trouble within Tibetan society and culture. They have already done irreparable damage to Tibetan culture within Tibet– now, through the Dalai Lama and the Shugden issue, they are attempting to do the same to Tibetan culture in exile. So it’s serious stuff in my opinion and strong action does have to be taken. Within Tibet, China’s actions are war and in war, the rules of democracy are slanted for the protection of the people– and in many cases, individual rights are seriously damaged and I agree that’s wrong. But in the minds of Tibetans, China’s actions are akin to acts of war– they’ve seen China at her very worst and know that she’s capable of horrible atrocities. Sometimes we in the West forget that. Another way to look at it: if you read some of the horrible vitriol being spread by Shugden supporters, then you will find actions that are what we would call in this country hate speech and hate crimes. Shugden people are, in my mind, very akin to a hate group. This new Tibetan parliament, new to democracy, knows that it is facing something very dangerous in the actions by Shugden people– they know they have to act– but Tibetan culture has not caught up yet in order to have the language to address it in ways that we Westerners would call democratic– such as outlawing hate crimes etc. At least that is how I view this trouble and the actions of the Tibetan government in exile– I try to view it from lots of different angles and within the context of all that Tibetans have been through. I thought we have been observing the workings of time honoured democracy within the monasteries? A history of democracy cannot be claimed at the same time as saying they are new to democracy. The process of democratic rule should function irrespective of the language used to describe it. The expression of that democracy, linguistically, should not be a problem given the resources at their disposal. you should go into politics-but only if it leaves you time to practice religion–ooops. theyre mutually exclusive……or are they? Thank you John. I don’t like the onesidedness of this announcement or declaration. It’s peoples’ freedom to ignore the advice. Although it is wrong to slander people (including the Dalai Lama) or to misinform people like the WSS/ISC(Delhi based Shugden Society) do, IMO the CTA would do well to put their energy in correct information and to counter the misleading propaganda by using arguments and not pressure against them. On the other hand Tibetans have their own way to address and deal with things and they might work for them or not, this is not my this is their business. How they approach it here is not my taste nor would it work for me. They are also factual incorrect by claiming that Shugden practitioners are only under the influence of China etc. For many of them it IS a religious issue but too many cling too much on it ignoring its political, sectarian stance and the harm of that practice. “tricky issue because it involves cross cultural issues and values …” That’s exactly the point I think. The middle east is such a good example of Westerners running around imposing culturally laden democratic principles… Democracy is an evolving process in every culture it finds itself (even in monasteries, John!) and it’s never going to look the way we want it. Even the term “religious freedom” is culturally loaded. Can you please debunk the ridiculous claim of the 16th Karmapa being pro-shugden? This is probably the most ridiculous lie conjured up by Shugdenpas yet. and this is the stance of the Kayguepas to whomever I spoke and asked. The bizarre claim seems to stem from an episode retold by a dolgyal lama who says HH Karmapa xvi visited a gonpa in Kathmandu and noticed a statue of Dorje Drolo (who they incorrectly identify as a Nyingma protector). According to the story told by the dolgyal lama, Gyalwa Karmapa notices that Dorje Drolo is treading on dolgyal and expresses displeasure saying whoever worships Dorje Drolo will become worshippers of dolgyal. This is obviously just a lie spread by a gyalpo spirit lama. Dorje Drolo is very important to Karma Kagyupas and the Karmapa in particular since Yongey Mingyur Dorje transmitted his Dorje Drolo terma to the 10th Karmapa. Kagyu depictions also show Dorje Drolo standing on a gyalpo and senmo spirit. Chogyam Trungpa Rinpoche discovered a terma where the Karmapa appears as Dorje Drolo. The 16th Karmapa recognised Trungpa Rinpoche as a great vidyadhara. Trungpa Rinpoche directed Sherab Palden Beru to paint the image from his terma describing each detail. I feel certain the story about Karmapa Ranjung Rikpe Dorje that the cult website put out is apocryphal. I know the previous Khenpo of Ka-Nying in KTM back in the day: it didn’t happen according to him. I also do not believe the person who calls himself ‘vajrabhijna108’ on reddit who claims “My root lama’s root lama was the last karmapa” who repeats the tale that is ‘in a sungbum’…so what? there is a lot of rubbish stories in Tibetan books…take the Yellow Book for example. So the contention of the modern day dolgyal cultists who claim that such depictions are a modern iconographical anomaly simply has no basis in fact. Check the Tibetan edition of The History of the Nyingma School illustrated by Phuntsok Sangpo was a master painter from Tsang who worked for King Senge Wangchuk of Bhutan, His Holiness Dudjom Rinpoche, Jigdral Yeshe Dorje and other eminent patrons. He painted Dolgyal subued by Dorje Drolod several times as did the late master Tibetan artist Sherab Palden Beru and Gega Lama from Lithang and Gomchen Oleshey. Four contemporary master artists, and none of them are wrong. Guru Dragpo, Heruka (Tibetan: drag tung. 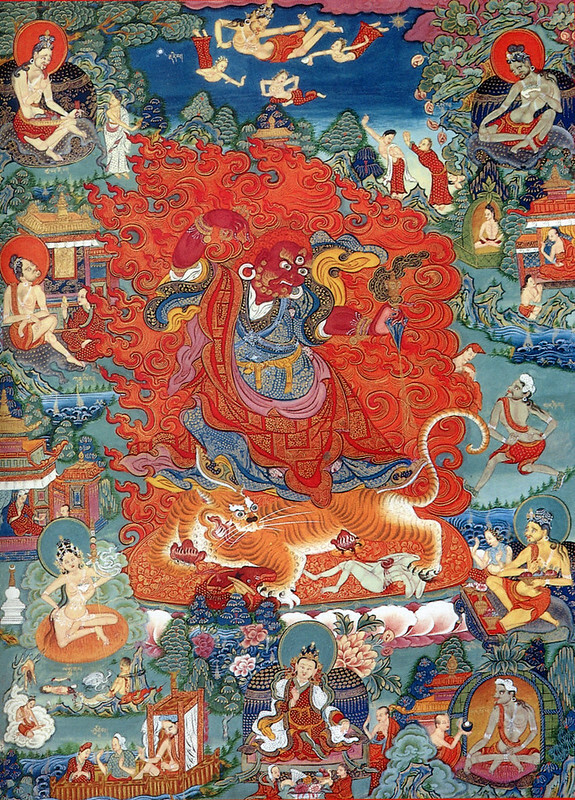 English: Blood-drinker): from the Lama Gongdu Cycle of Revealed Treasure (Tibetan: ter ma) teachings of the Nyingma tradition is in the Shechen collection of HAR: Dolgyal subued again. See also Illuminations from the Gold Manuscript in the Fournier Collection, Musée Guimet, Paris/ Samten Karmay’s, Secret Visions of the Fifth Dalai Lama, Serindia, 1998. See if you can find him in the Lokesh Chandra publication of the 510 iconographic images known as the Mongolian Pantheon. The pages below contain all of the images in sequential order at http://www.himalayanart.org/search/set.cfm?setid=2616. It is interesting to note that neither the Mongolian Pantheon nor the Prajnaparamita Block Print Images, Mitra Gyatsa Block Prints, Rinjung Lhantab of the 4th Panchen Lama nor any other Tibetan Buddhist Pantheon such as the Narthang set includes even one depiction of Dorje Shxxxen Dolgyal, the minor and obscure worldly protector –and that is out of literally thousands of images of Buddhist deities! As these collections are essentially Gelugpa, this absence is indeed significant. Only Phobanka and his cultists have distorted this spirit as a “wisdom buddha” a term they apply loosely to whomever they fancy–like former Geshe Kelsang Gyatso–for example. Yes, Namkhah, I only mentioned the painting by Sherab Palden Beru as it illustrates the absurdity of the dolgyal peoples’ claim. That HH Karmapa himself is depicted trampling dolgyal is evidence that he would never criticise another Drolo image depicting the same thing. Of course, there are many Nyingma images of Drolo standing on the gyalpo but that there are images of the common Kagyu Drolo practice showing the same thing further shows the dolgyal followers claims to be a lie. I have a couple of versions of this depiction from Yongey Mingyur Dorje’s terma, but I couldn’t find anything on line. Actually, this is much much older, it’s ancient Indian iconography. Kali for example is depiced just like that. But not necessarily on a gyalpo and senmo. Given the age of these depictions I personally wouldn’t identify the gyalpo as dolgyal. He is a generic gyalpo that represents hatred and pride as the senmo represents desire and jealousy. Dorje Drolo overcomes the poisons that these demonic forces embody. I think the relatively recent worship of a gyalpo who attacks the Nyingma tradition just adds another layer of meaning to this symbolism. Yes that’s true, the rGyalpo is invariably referred to as a malignant demon in Tibetan Medical Paintings, Illustrations to the Blue Beryl Treatise of Sangye Gyamtso, edited by Yuri Parfionovitch, Gyurme Dorje and Fernand Meyer and also another version of the same book Tibetan Medical Thangka of the Four Medical Tantras (gso.rig.rgyud.bshi.’sman.thang), published by People’s Publishing House of Tibet, translated by Byampa ‘Phrinlas. There are about twenty or so pictures of king demons, identified as the cause of a range of serious physical and mental illnesses. Kidney ailments, abnormal pulses, edema of the feet, pathogenesis of the bladder (frequent urination), women’s diseases, and so forth. “In 1672, (the Fifth Dalai Lama) entered into retreat and beheld the diety rDo-rje-gro-lod, one of the eight aspects of Padmasambhava, as he himself had described the deity’s iconography in his own work, rDo rje gro lod kyi chog bsgrigs gnam lcags ‘bar ba (NyK01535,Tha). So to summarize, there is absolutely no evidence that Karmapa liked Shugden, and there is actually evidence to the contrary. I thought so. Karmapa liking Shugden would be like gay men liking Diora Baird. Karmapa liking Shugden would be like gay men liking Diora Baird?? What does this mean?